The item is a portable and practical jewelry storage box organizer, which is mainly made of durable non-toxic clear hard plastic material, and consists of 36 grids ideal for storing earrings, rings, beads and other mini jewelry. The dividers inside the box can be moved and adjusted to create your own size compartments. Besides, the storage box can also be used to store a variety of pills and a variety of small drugs. – Total size (L*W*H): about 27.5*17.8*4.3cm. Each grid size (L*W*H): 4.5*3*3.8cm. – This small and clear storage box makes storing easier and you can reach the things simpler and quicker. – Portable design and easy to use carry. 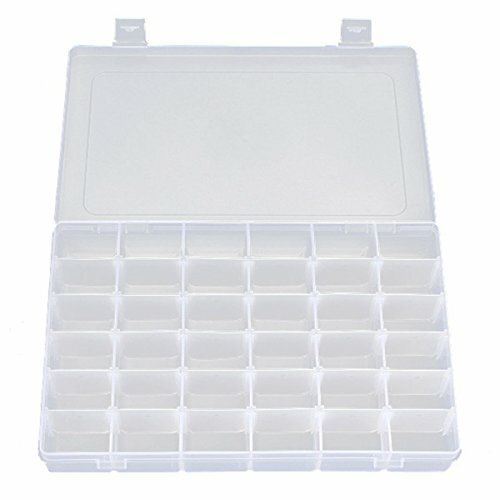 1 * OULII Portable Clear Plastic Jewelry Box Organizer Storage Container with Adjustable Dividers, 36-GridColor: clear. Material: durable hard plastic. Total size (L*W*H): about 27.5*17.8*4.3cm. Each grid size (L*W*H): 4.5*3*3.8cm. 36 grids clear hard plastic storage box organizer, simple and practical. Perfect for storing earrings, rings, beads and other mini goods. Removable dividers: The grid inside the box can be moved, so you can adjust the dividers to create your own size compartments. Can also be used to store a variety of pills and a variety of small drugs.